March was perhaps the busiest month of my life. Pushed out a couple new case studies. Wrestled with the tax man. Dealing with a tenant turnover. But most of my time was spent on a few things I’ll announce later this summer. 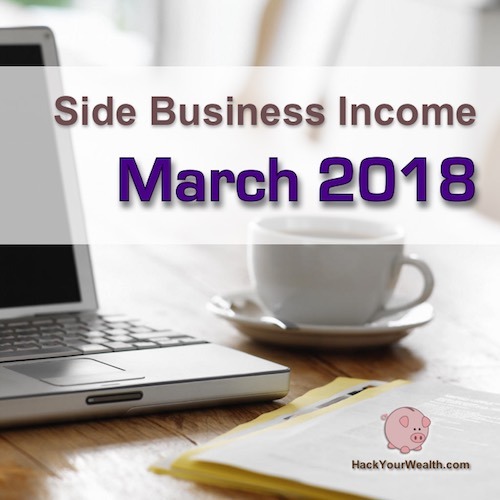 In March, side income was $3,540, up +38% year over year. One of my tenants (different rental property, not the house hacking one) gave notice they’re leaving. Found a great new job in Austin, Texas. Lucky them! Hope they check out my guide on how to research real estate markets, which showcases Austin specifically. This also means in April and May I’ll be spending some time getting the unit tuned up and re-rented. I just filed taxes for 2017. Man, what an ordeal. And a really big bill. I’ve increasingly come to expect this time of year to contain unpleasant tax surprises, and this year was no exception. It was also our most complicated filing yet, given how much we had to account for, between W-2 jobs, rental properties, small business income, investment income, etc. And even though in 2017 I intentionally withheld much more from my W-2 paychecks than required, there was still a big gap vs. year-end tax liability. It’s because of the side business and rental income, which doesn’t have built-in withholdings. I’m seriously thinking about hiring this out to a CPA. The thing that holds me back is knowing that no other human on earth will care as much about our tax situation as we do. Where a CPA adds value is introducing you to new strategies (and combinations of strategies) to minimize taxes. But they’re only looking at your situation closely at tax filing time. They’re not (generally) managing your finances side by side with you throughout the year (unless you’re super wealthy and are paying them accordingly); only you will be thinking about your finances day in, day out. Only you will have the understanding and motivation and insight to constantly think about how to structure your finances and optimize your tax situation. So it’s a tradeoff. Ideally, you read about and learn so much tax strategy, and become so proficient and fluid in thinking about it, that you become extremely effective in managing your finances / tax situation on your own. That requires a lot of learning and investment in knowledge, of course, so you have to be intrinsically interested to stay motivated. Otherwise, it probably makes sense to outsource the work to a CPA once you cross a certain complexity threshold. TurboTax is powerful, but at the end of the day it can’t think for you. Luckily, I get pretty obsessively interested in learning tax strategies myself. Where I have to think further is, at what point does spending my own time self-optimizing fall short of the time and effort required to do it? In March, I also published two new case studies. 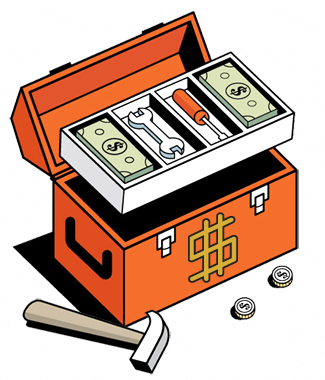 One on how to find and vet good contractors for home remodeling and repairs. The other on how to minimize rental vacancy even before you officially close on a new rental property purchase. If you’re wondering how to do these things, or just want to see how another landlord does it, check out the posts! Have another case study coming up. It’ll cover the top home remodeling tips we learned on our 4-plex for saving serious money and getting the most from your contractors. And I’m still figuring out when I can carve out time to do a case study on the Tax Cuts and Jobs Act, particularly strategies on how to leverage key provisions for wealth building. 3. Announcements? Delayed for a couple months…. I mentioned last time that I hoped to have a few announcements to share soon on some exciting stuff we’ve been brewing for a while. I was originally hoping to do it in this income report, but for various reasons will have to delay it to summertime. There’s some major stuff, though, so stay tuned for it!